I am writing this week's article from Denver, CO at the 76th Annual NASDSE conference. My first trip to Washington, D.C., after I became Executive Director of CASE 12 years ago included an appointment with Dr. Bill East, Executive Director of the National Association of State Directors of Special Education. It only made sense to me that local directors need a healthy relationship with the State director and State directors have to have the cooperation of the local directors so CASE and NASDSE should work together closely! One suggestion I made during that meeting was perhaps we should have a joint conference sometime. CASE and NASDSE have partnered on many things since that fateful meeting in July 2002. We partnered with NASDSE on the RTi Blueprints, CASE has been a very strong partner with the IDEA Partnership, and most recently CASE is one of 4 partners, including NASDSE, NASP and NCLD on the LD Roundtable/Toolkit. Proof of our deep partnership with NASDSE occurred in 2009 at Kiawah Island, SC when NASDSE awarded me their award for partnership, the Martha Fields Award. Certainly that was for CASE and not me personally. CASE has made a commitment that either or both the Executive Director and President will attend the national NASDSE meeting every year. Last year when NASDSE was in Atlanta, President Fred Balcom (CA) sat beside me and asked what I thought about NASDSE and CASE having a joint conference sometime in the future. This year the NASDSE conference was especially significant because at lunch on Tuesday, Oct. 7, Dr. East and I announced in 2016 NASDSE and CASE would be hosting a JOINT conference in Milwaukee, WI Sept. 25-27! Mark your calendars now for this historic event! 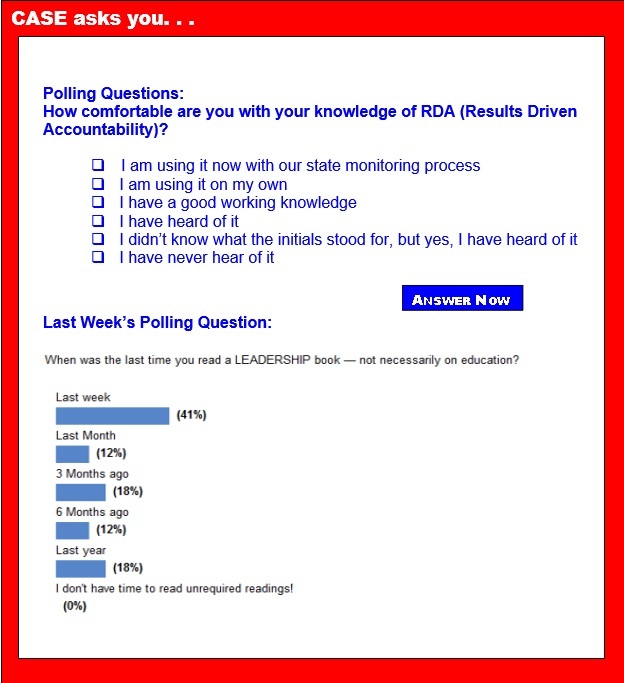 One of the hot topics at NASDSE was RDA. Dr. Melody Musgrove, Director of the Office of Special Education Programs, gave the opening address on Results Driven Accountability as well as other OSEP initiatives. We also heard from Montana, California and Colorado all on aspects of working together to make major advances in getting better outcomes for students. Mark your calendar now for the upcoming CASE 4th Annual CASE hybrid conference, Feb.19-20. Remember as a hybrid, you pick the location! Of course, you can join us in Phoenix, Arizona, but there will be a very limited number of on-site slots but we have an unlimited number of virtual sites! Watch this update for additional information on how to make the most of your virtual site and more on the various speakers. One day will be devoted to Results Driven Accountability through Leading by Convening and the second day will be a day of legal updating, featuring Julie Weatherly! Save the date now! I would love for you to go to our CASE Facebook page and list great leadership books you have read and why you would suggest your colleagues read them. Let's get a conversation going on about good leadership reads! Speaking of issues. What are issues you are facing this year that you need more information on? Thank you to those of you who took the CASE research committee survey last week, but for those of you who meant to but haven’t, please take a moment and let us hear from you what we need to be digging deeper on for your benefit! Click here to take the quick survey! Still haven't registered for the 25th Annual CASE Fall Conference? Well, there is still time! The room block is filling up but there are still rooms available. Professional Development Chair, Will Gordillo has put together an amazing program for our CASE members for the 25th Annual CASE fall conference! Our three keynotes will definitely inspire you but they also will provide you with a wealth of practical tools you can use in your everyday work ASAP. Drs. Stevan Kukic, Randy Sprick, and Frances Stetson will totally blow you away with the quality of their presentations! I have heard each of these 3 professionals on many occasions and I have always left with new ideas, new tools and a feeling that the job I do is important and necessary! The 30+ breakout sessions are also full of practical, evidenced based information. Click here for a list of the breakout sessions. If you want to learn what's new, connect with your colleagues from around the U.S. and Canada, and experience some quality professional learning that is both inspirational and content laden, then join us in San Antonio Nov. 13-15! Registration is up at www.casecec.org. We will be at the Hyatt Regency San Antonio which is located on the amazing River Walk. The group room rate of $139 is one you will not want to pass up! Click here for the hotel registration which is good through Oct. 19. See you in San Antonio! Did you get your CEC Ballot? CEC's membership-wide election for the 2015 Board of Directors opened on Monday, Sept. 29. CEC leadership must represent the beliefs and values of its members — and you have a voice in electing CEC's future leaders. Vote for YOUR 2015 Board of Directors during the membership-wide election period from Sept. 29 - Oct. 27. Do you know a new special education administrator who routinely "stick their neck out" for teachers and students? CASE has a new award just for you! It is called the "G" AWARD for Rising Special Education Administrators and was instituted for a member of CASE who is early in her/his career as an administrator. This individual may be nominated within their first 3 years of administrating special education programs/services and the award will be accompanied by a night on the town in their home area (limo, dinner, movie, child care, etc.) up to a $500 value. This award is acknowledgement for the administrator for sticking his/her neck out to better support their teachers to enable them to make a difference in the lives of the students they serve. This award will continue as long as the benefactor continues to provide the monetary award. Click here for more information. The deadline is Oct. 31 and is an absolute deadline! Click here for the nomination form. Send the application and any questions to Emilie Maule. The G Award will be announced and presented at the 25th Annual CASE Fall Conference in San Antonio. A Principal's Guide to Special Education has provided guidance to school administrators seeking to meet the needs of students with disabilities. The third edition of this invaluable reference, incorporating the perspectives of both teachers and principals, addresses such current issues as teacher accountability and evaluation, instructional leadership, collaborative teaching and learning communities, discipline procedures for students with disabilities and responding to students' special education needs within a standards-based environment. Get your copy today! Enter code PRCASE at checkout. Are you looking to find resources about special education, intensive intervention, progress monitoring, diagnostic assessments, adapting interventions to meet student academic and behavioral needs? Are you looking for sample lessons and activities to support students that are struggling in math? Do you have questions for NCII? NCII is excited to announce that we have joined twitter. Please follow us at @TheNCII. We will be sharing our own updates and relevant partner resources. NCII has also created a National Center on Intensive Intervention YouTube Channel where you can find NCII videos including archived webinars, ask the expert videos, and more. In addition to these two new social media outlets, we have made it easier for you to share NCII resources on Twitter, Facebook, Linked In, email and more. Look for the icons on the bottom of each page to share NCII resources in your networks. NCII has released the final module in the DBI Training Series, Informal Academic Diagnostic Assessment: Using Data to Guide Intensive Intervention! The multi-part module covers four parts. Part 1 provides an overview of administering common general outcome measures for progress monitoring in reading and mathematics; part 2 reviews graphed progress monitoring data; part 3 introduces error or miscue analysis of curriculum-based measures for the purpose of identifying skill deficits in reading and mathematics; and part 4 offers guidance on identifying what type of skills the intervention should target to be most effective in reading and mathematics. The module is intended to be delivered by a trained, knowledgeable professional. It includes a PowerPoint presentation with speaker notes and handouts. View the multipart module and resources, as well as the entire DBI Training Series! The Institute of Education Sciences calls for feedback on research centers! The Institute of Education Sciences, the research arm of the U.S. Department of Education, has issued a request to the field for feedback (http://ies.ed.gov/pdf/2014-NCERfeedback.pdf) on the work of its two research centers: the National Center for Special Education Research and the National Center for Education Research. IES intends to use the input it receives to help plan the future work of these research centers. The deadline for submitting comments to IES is Oct. 31. DEC in collaboration with CEC announces its campaign for support of the Strong Start for America's Children Act and increased funding for Early Childhood IDEA programs. A new Gallup poll shows that 7 in 10 Americans say they favor using federal money to make sure high-quality preschool programs are available for every child in the country. President Barack Obama has asked Congress to fund universal access to high-quality preschool programs for all 4-year-olds in his FY 2015 budget request. Many governors and mayors are also calling for an expansion of early education. The U.S. Department of Education recently released applications for the Preschool Development Grants competition. There are two types of grants. Development Grants that will will support states with either small or no state preschool programs to implement and sustain high-quality preschool programs in one or more high-need communities. ED and HHS are pleased to release a new resource on Kindergarten Entry Assessments in Race to the Top — Early Learning Challenge States. Under their Race to the Top — Early Learning Challenge grants, States are revising existing or implementing new kindergarten entry assessment tools. Who is responsible for IEP goals? As the beginning of autumn appears, public school is well underway for the more than 2 million students identified with learning disabilities in the United States. These students are being instructed by teachers whose responsibility is to assist them in meeting their Individual Education Plan goals. The IEP was first introduced in 1975 as part of the Individuals with Disabilities Education Act. The individualized education goals are a pivotal part of this legal document and are crucial to the student's success. Was it the intent of the designers of this document that decisions and educational goals be made for the student or with the student? A chance meeting in a Sarasota restaurant put Amanda Taylor, the mother of a student with special needs, in touch with activist Jon Singer. Taylor described the frustration she was having getting her daughter the services she needed at Robinson Elementary School in Plant City. Singer, who works in financial services and splits his time between Sarasota and New Jersey, offered to put her story on his Facebook page. Taylor approved the scathing diatribe against the Hillsborough County School District, packaged with pictures of 8-year-old Alexis. Is it bullying, or ordinary meanness? Eileen Kennedy-Moore, Ph.D., a contributor for Psychology Today, writes: "If you say the word 'bullying' in a classroom full of elementary school kids, here's what happens: Hands shoot up. Everyone has a story about how someone bullied him or her. Bullying is a serious problem that can have devastating effects. As a clinician, I've seen more than a few adult clients brought to tears by memories of horrifying peer abuse. I've seen kids who feel frightened or wounded by their peers' cruel words or actions, and parents who feel angry or helpless in the face of their child's victimization by other kids." Looking at colleges is stressful for almost all students, but for those with dyslexia the process can be filled with unique challenges. Dyslexia, a learning disorder that makes it difficult for students to read easily, is still often misunderstood by many teachers and school administrators. "Our brains are wired to speak and to learn language," says Ben Shifrin, head of the Jemicy School in Maryland and an Executive Board member of the International Dyslexia Association. "Reading is something that was created by humans and it is not natural for some people." The results of a study published in Pediatrics reinforced a growing body of research suggesting that physical activity is helpful in reducing symptoms of attention-deficit/hyperactivity disorder in children. The study, which involved more than 200 students ages seven to nine, took place over a ninth-month period in Urbana, Ill. Scientists compared the brain activity of students involved in an after-school program that required 70 minutes of physical activity and those who were on a wait list. The control group did not increase its physical activity. Eileen Kennedy-Moore, Ph.D., a contributor for Psychology Today, writes: "If you say the word 'bullying' in a classroom full of elementary school kids, here's what happens: Hands shoot up. Everyone has a story about how someone bullied him or her." With racial minorities still less likely than white students to have access to rigorous academic classes or experienced and qualified teachers, the Obama administration will announce guidelines to ensure that strong teachers, high-level math and science courses, quality extracurricular programs, and equivalent technology and school facilities are available for all public school students. The U.S. Supreme Court asked President Barack Obama's administration for its views on whether it should take up a case involving an important interpretation of federal special education law. A Pennsylvania school district, joined by several school groups, is asking the high court to interpret the an aspect of the "stay-put" provision of the federal Individuals with Disabilities Education Act. That provision means a child stays in his or her current educational placement during administrative and legal proceedings over a disputed education plan. A new bounty of academic data is guiding teachers as they adjust instruction in the hopes of boosting student achievement. Some districts are connecting "data coaches" with the teachers' own professional learning communities to ensure this bounty of information fulfills its pedagogical promise. Using portions of the $4 billion Race to the Top initiative, educators in Delaware, Rhode Island, Hawaii and other states have been working with data coaches — many of whom are former teachers — to learn how to parse data to plan lessons and reach end-of-year academic benchmarks, among other short- and long-term goals. Where do we stand on NCLB? More than 40 states may have waivers from many of the mandates of the No Child Left Behind, but that doesn't mean the U.S. Department of Education is off the hook when it comes to reporting on states' progress toward meeting the goals of the NCLB law to Congress. The administration recently released an NCLB snapshot of sorts, looking at where states were during the 2011-2012 school year. Genetics may account for as much as 60 percent of academic achievement, according to a new British study. "Genes are important not just in educational achievement or intelligence but in a whole raft of other traits which contribute to how easy and enjoyable children find learning," said study co-lead author Eva Krapohl, a graduate student at King's College London in England. The research looked at two different things: intelligence and educational achievement. In terms of intelligence, previous research has shown that "about half of the total variance of intelligence can be accounted for by genetic factors," said co-lead author Kaili Rimfeld, also a graduate student at the same college. Why turn to interdisciplinary learning? How do the words interdisciplinary or trans-disciplinary feel? They can both give rise to confusion, resistance, wonder, but then are often abandoned. After all, what do they have to do with accountability for minutes of instruction and preparation for standardized tests? How much do we really know and understand about the "inter" or "trans" nature of everything? And finally, how much do leaders know about how to lead teachers to a place where it can happen? "Common Core" academic guidelines for public schools are sowing controversy as teachers implement them across the USA. Several states have balked at requiring them and even comedian Louis C.K. last May took to Twitter to complain, "My kids used to love math. Now it makes them cry. Thanks standardized testing and common core!" But teachers in states where the math and reading standards have been in place longest say that, in spite of the criticisms, Common Core is going well — and that most teachers feel prepared to teach new kinds of lessons. Gaming vs. reading: Do they benefit teenagers with cognition or school performance? Children have an increasing attraction towards electronic media in their play. With video games, phones and the internet in abundance, a new article examines if such leisure activity is impacting children's cognition or academic performance or whether it would be more beneficial to read. The following Notice of Agency Information Collection Activities; Comment Request; State and Local Educational Agency Record and Reporting Requirements Under Part B of the Individuals With Disabilities Education Act was published in the Federal Register on Tuesday, Sept. 16. Summary: In accordance with the Paperwork Reduction Act of 1995 (44 U.S.C. chapter 3501 et seq. ), ED is proposing a reinstatement of a previously approved information collection. Dates: Interested persons are invited to submit comments on or before Nov. 17. The following Notice of Agency Information Collection Activities; Submission to the Office of Management and Budget for Review and Approval; Comment Request; Annual Protection and Advocacy of Individual Rights Program Assurances was published in the Federal Register on Tuesday, Sept. 16. Summary: In accordance with the Paperwork Reduction Act of 1995 (44 U.S.C. chapter 3501 et seq. ), ED is proposing an extension of an existing information collection. Dates: Interested persons are invited to submit comments on or before Oct. 16. The following Notice of List of Correspondence From July 1, 2013, Through Sept. 30, 2013 was published in the Federal Register on Thursday, Sept. 18, 2014. Summary: The Secretary is publishing the following list of correspondence from the U.S. Department of Education to individuals during the previous quarter. The correspondence describes the department's interpretations of the Individuals with Disabilities Education Act or the regulations that implement the IDEA. This list and the letters or other documents described in this list, with personally identifiable information redacted, as appropriate, can be found at: http://www2.ed.gov/policy/speced/guid/idea/index.html.